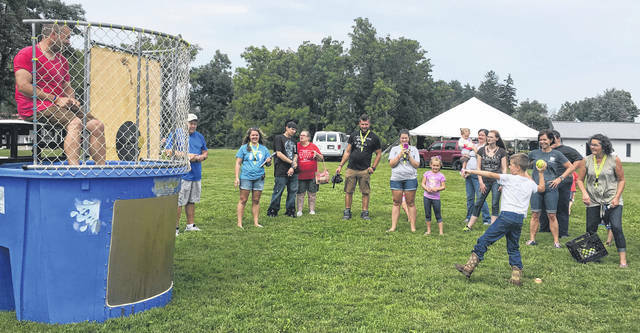 Pastor Andrew Johnson cheers as Cody Bowen is knocked into the dunk tank at the CommUNITY event on Saturday. Cody Bowen and Tim Ryan meet in person for the first time. Children enjoyed a water fight at the event. Pastor Andrew Johnson awaits his fate in the dunk tank. 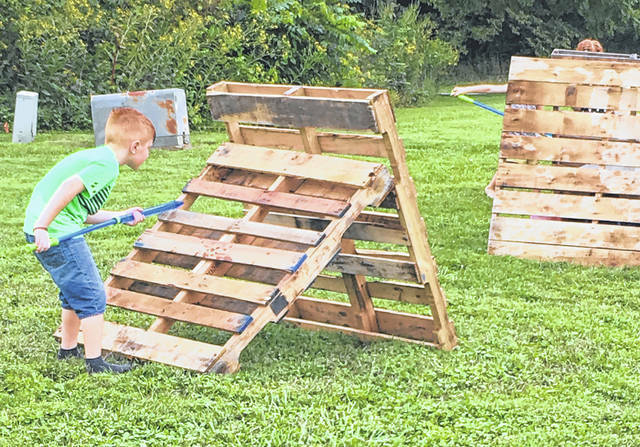 On Saturday, about 250 people filled the Baptist Bible Temple’s property. These individuals came together in an effort to raise awareness of the opioid crisis in Fayette County, to remember loved ones who have been lost to overdoses, and to share messages of hope. The event was organized by Chad Gentry and Cody Bowen. Gentry grew up in Washington Court House and is now a drug and alcohol abuse counselor in Portsmouth. 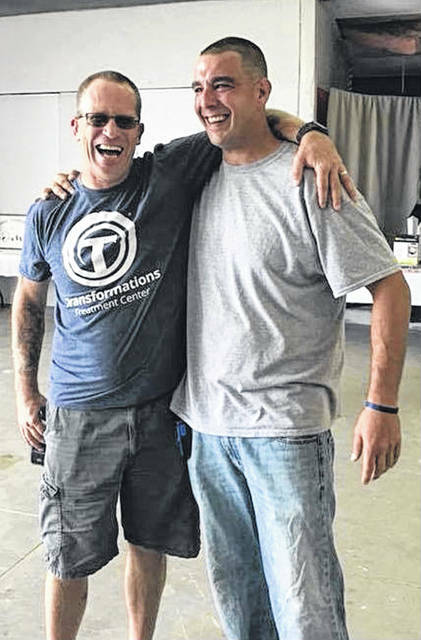 Bowen is a recovering addict, and the event marked the one-year anniversary of his sobriety. The use of the property was provided by co-pastor of the Bible Baptist Temple, Andrew Johnson. Gentry stood on stage, surveyed the crowd and said, “What started as a dream became a reality real quick.” He said many people helped to make the event a possibility. 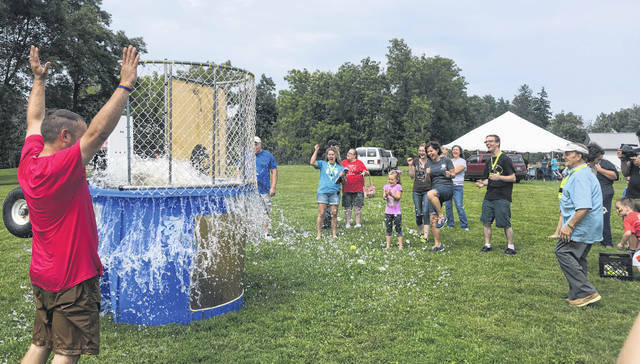 The event featured a silent auction, games and fun for the kids, a dunk tank, and more. Most importantly, several recovering addicts stood up on stage and shared their stories. They spoke of their struggles with addiction and shared messages of hope. Fayette County Sheriff’s Office Chief Deputy Andy Bivens, as well as other first responders, were present at the event. He looked out at the crowd from the stage and said, “Congratulations. Congratulations on what you’ve done.” He said it was great to see so many individuals in recovery and looking so healthy. He also stressed that “with each drug that we’re dealing with now we’re seeing it become more and more lethal. The hardest thing in the world to do is to walk up to some parent’s house and knock on the door and tell them their child is dead, or to look into the face of some little child and tell them their mom or dad is not coming home.” He said this to murmurs of agreement from the crowd, many of whom had been on the receiving end of such news, having lost their children or their parents or their other loved ones to overdoses. Several recovering addicts who shared their stories on Saturday said that they had to leave home in order to get sober. One such individual was Skylar Williams, a native of Washington Court House, who used for 13 or 14 years before finally getting on a plane for California one day where he found sobriety in a treatment center. “I have a good life today,” he said, and he hopes others who are struggling with addiction will someday be able to say the same thing. In addition to the locals who shared their stories, there were some speakers who had traveled from out of state to be at the event. One was Rich Walters of Parkersburg, West Va. Walters said he abused drugs for 21 years before finally getting sober. Today, he is the national marketing director at the Boca Recovery Center. The last speaker at the event was Tim Ryan. Ryan is the author of the book “From Dope to Hope,” founder of the A Man in Recovery Foundation, and a well-known public speaker. He is also a recovering addict who spent time in prison and lost his own son to an overdose. He knows first-hand the challenges that addicts face and he also knows that recovery is possible. They listened. Within 20 minutes of Ryan’s speech, all five treatment scholarships had been claimed. These scholarships, with a combined value of over $100,000, will cover the expense of substance abuse treatment for their recipients. Most of these recipients were put on planes that night or the next day and sent to treatment.